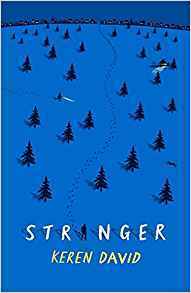 I thoroughly enjoyed Stranger. I really enjoy novels where the narrative is split between a linked contemporary and historical story where at first the link isn't fully clear and over the course of the novel the linked are unveiled so I was incredibly excited to read this book. The contemporary story is really lovely. It follows Megan who has arrived in Canada to celebrate a special family occasion and spend time with her father who she lives hundreds of miles away from. While it is supposed to be a happy time for her she has a broken heart and a secret which is meaning, whilst she is putting on a brave face underneath it all she s really suffering. I really enjoyed she the family dynamic, uncovering her secret and seeing her time in Canada. The historical story is Emmie's story as she discovers a wild boy in the forest and, along with her mother, welcomes into her home despite the reaction it gets from her neighbours . I thoroughly enjoyed the historical aspects of the story and also getting into the mystery of who the boy was and why he had ended up as he had and it kept me guessing right through.